This article first appeared in Slightly Foxed: The Real Reader’s Quarterly, Issue 51, Autumn 2016. I watched a lot of television in my twenties and I doubt whether it did me much good. But it did lead, indirectly, to my discovering the fascinating novels of Nigel Balchin. In 1990 I saw a TV drama series, bought a copy of the book on which it had been based and, among the endpapers, spotted a notice for another novel that sounded intriguing: The Small Back Room by Nigel Balchin. I’d never heard of Balchin but tracked down The Small Back Room, read it and instantly became an ardent fan. I devoted much of the rest of the decade to finding and reading his other novels (he wrote fourteen in all), and now consider Mine Own Executioner to be one of the very best of them. Balchin graduated from Cambridge in 1930 with a degree in Natural Sciences. He had studied psychology during his final term, and this enabled him to obtain a position as an industrial psychologist. In 1933, while on secondment to the confectioners Rowntree’s, he helped the company launch a new chocolate assortment. How many people who put a box of Black Magic in their supermarket trolley today know that its colour scheme was the work of a famous novelist? Standing in front of a confectioner’s shop window in search of inspiration, Balchin said that he could see every colour but black and realized that a black box would be both eye-catching and clearly differentiated from the competition, which relied in the early 1930s on classic staples of ‘chocolate-box art’ – ivy-clad cottages, rosy-cheeked children and adorable kittens and puppies. During the early part of the Second World War, Balchin worked for the Ministry of Food, where he was responsible for the allocation of supplies of raw materials to chocolate manufacturers. This phase of his wartime career provided much of the material for his first well-received novel, Darkness Falls from the Air (1942). Then in 1941 he swopped butter for guns and joined the army. He helped to overhaul the service’s personnel selection procedure before transferring to the army’s scientific research wing, where he was responsible – among other things – for advising on the practicality of new weapons. His war work during this period informed The Small Back Room (1943: see SF no. 24). In 1945 he was promoted to Deputy Scientific Adviser to the Army Council and made a Brigadier at the age of just 36. Balchin’s attempts before the war to succeed as a writer had ended in failure. After a false start as a playwright, he wrote seven books in the mid-1930s but most of them sank without trace. It was not until the war had been in progress for more than three years that he wrote a successful novel. Lauded retrospectively as ‘the classic novel of the London Blitz’, Darkness Falls from the Air can be considered the point at which his writing career really took off. All 5,000 copies of the book – paper rationing prohibited a longer print run – sold in a trice. The Small Back Room, which followed Darkness Falls from the Air, sold hundreds of thousands of copies and remains Balchin’s finest achievement as a novelist. But his next book, Mine Own Executioner (1945), ran it very close in terms of sales, and a number of reviewers in the 1940s preferred it. L. P. Hartley called it ‘a triumphant success – the kind of success that makes one want to clap’, and John Betjeman characterized it as ‘an exceptionally good novel’. Much more recently, Philippa Gregory has observed that Mine Own Executioner represents ‘the most extraordinary exploration of the human condition’. The novel tells the story of Felix Milne, a London psychoanalyst who divides his working life between his own private practice and a clinic offering free psychotherapy to those unable to pay for it. Balchin packs a lot of varied material into the first half of the novel. The accounts of Milne’s patients and their neuroses are fascinating, and the depiction of the psychoanalyst’s strained relationship with his long-suffering wife Patricia is well observed and touching. If the scenes in which Milne attempts to start an affair with Patricia’s best friend Barbara are less successful, they do at least furnish the book with an extra dimension. The second half of Mine Own Executioner is very different. Having presented these various plot strands, Balchin picks out one of them and chooses to develop it more fully than the others. Adam Lucian is a young Spitfire pilot. Shot down over Burma during the war and captured by the Japanese, he manages to escape but then, back in London in peacetime, he attempts to strangle his wife Molly and so she persuades him to undergo analysis with Milne. Milne injects Lucian with a hypnotic drug and coaxes his war memories out of him. Lucian reveals that he had given information to the Japanese under torture and Milne believes that it is this moment of self-perceived weakness (Lucian refers to his capitulation as ‘a bloody disgraceful business’) that has caused his patient to become mentally unbalanced. But is there more to it than that? Is there something buried in Lucian’s subconscious that represents the real reason for the man’s murderous designs on his wife? The rest of the book describes Milne’s attempt to delve deeper into Lucian’s mind before he harms Molly again. There is much to enjoy in Mine Own Executioner. The principal players in the story are all likeable and interesting but the care Balchin lavishes on his minor characters – a consistent strength of his fiction – is arguably even more impressive. Several of Milne’s patients lodge in the memory and Balchin also draws superb pen portraits of the psychoanalyst’s colleagues at the clinic: ‘Tautz, about five feet two and completely round, Phyllis Snow, a school-teacher with a secret sorrow, and Paston . . . looking like a commercial traveller for something rather shady’. There is a very amusing description of a cocktail party and in the book’s penultimate chapter we are treated to what must surely be one of the most entertaining courtroom scenes in twentieth-century fiction. The book is not perfect by any means. Balchin usually excelled at penning fresh, lively dialogue but some of the language in this novel grates on the modern ear. (When he reviewed the book in 1945, Peter Quennell remarked that Balchin possessed ‘a knack of writing dialogue (intended, I suppose, to be smartly topical) which causes the gorge to rise and sets the teeth on edge’.) He also struggled throughout most of his career to create believable female characters and, true to form, Patricia and Barbara are not as convincingly drawn as the male characters in the book. Mine Own Executioner was filmed in 1947 in an agreeably noirish way, the script being written by Balchin himself. It may seem a little stiff and wordy to the contemporary viewer but, with its exciting, thriller-style ending, it still stands up as one of the better British films of the late 1940s and one of the best screen representations of psychoanalysis. Balchin was not a psychoanalyst, however, so where did he obtain his material? I believe that most of it came from speaking to the psychiatrists with whom he had worked during his wartime stint as a member of the army’s personnel selection unit. As Balchin said himself, the psychoanalytical content of Mine Own Executioner ‘was based more on my experience of psychiatry during the war than on anything I learnt at Cambridge’. When he had finished writing the novel, Balchin was dissatisfied with it, largely because he felt he had allowed the plot to run away with itself and smother the psychoanalytical theme in the process. He tried to tear up the manuscript, failed and instead just hurled the (unnumbered) pages in the air in fury. His wife came into his study and said ‘I see exactly how you feel but I don’t think I’d just throw it away.’ The many readers who have derived pleasure from reading the novel over the last seventy years owe Elisabeth Balchin a debt of gratitude for persuading her husband to persevere with it. Almost as soon as the accolades that Balchin received for writing Mine Own Executioner had died away, the author’s troubled personal life began to affect his writing career. An initially light-hearted partner-swopping arrangement with the artist Michael Ayrton ended when Elisabeth fell irreversibly in love with him. Balchin divorced her in 1951 and she married Ayrton the following year. Life for Balchin was never quite the same again without Elisabeth. He remarried in 1953, his new bride being his young Yugoslav secretary Yovanka Tomich, but his second marriage was a turbulent one, undermined by his increasing dependence on alcohol. He drank very heavily from the late 1940s onwards and ended up an alcoholic. Balchin died in 1970, aged 61. He has been largely forgotten by the literary world over the intervening thirty-five years but some writers still admire him: Clive James for one has observed that Balchin was ‘in many ways the missing writer of the Forties’. Because he wrote with a psychologist’s sure grip about universal concerns – life and death, love and loss, right and wrong – Balchin’s novels have a timeless quality. Mine Own Executioner, Darkness Falls from the Air, The Small Back Room and a handful of others are also immensely readable and deserve a place on the bookshelves of all bibliophiles. 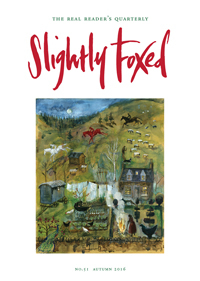 © Derek Collett, Slightly Foxed: The Real Reader’s Quarterly, Issue 51, Autumn 2016. Ten years in the making, Derek Collett’s biography of Balchin, His Own Executioner: The Life of Nigel Balchin, was published last year.